Fox Chairman and Silvestre De Sousa win Division I of The Dubai Duty Free Tennis Championships Maiden Stakes race. Mohaather emerged as a genuine Qipco 2000 Guineas contender with a clear-cut success in the Watership Down Stud Greenham Stakes at Newbury on Saturday. Balding said of the 10-11 winner: “The form of his maiden got franked when King Ottokar won on Friday. “He does quite a lot of work on his own as he can be a little bit keen. Fox Chairman (15-8) got the ball rolling for Balding when making a big impression on his debut, quickening clear late on to take division one of the mile prize by four lengths. 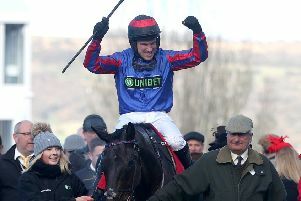 Takingrisks caused a 25-1 surprise in the Coral Scottish Grand National for trainer Nicky Richards and jockey Sean Quinlan at Ayr.